You can now enjoy a short story of mine, absolutely free with no strings attached. The story is Yestermorrow, a time-bending SF tale that first appeared in Solaris Rising – the New Solaris Book of Science Fiction. 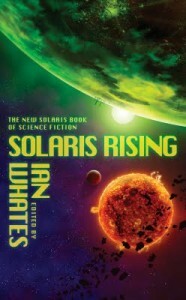 It is available with the kind permission of editor Ian Whates and Solaris’s Jonathan Oliver. Reviewers say Yestermorrow is “amazing” (A Fantastical Librarian), “a mind boggling wibbly wobbly timey wimey story that stands out highest of all” (Terror-Tree), and “my favourite story in the anthology” (SF Crowsnest). There are two versions available for download, both in PDF format. The first is suitable for viewing on your laptop or for printing. I just read Yestermorrow and couldn’t put it down. Great story!